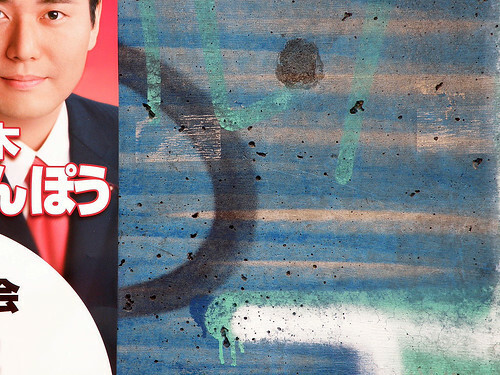 A difficult system in recent years “Fluidity of the employment” and “Unequal society-格差社会”. People will be exhausted by adapting oneself to them now. As a result,It is a domestic happy circle that people become the place which carries out a thinking stop at such time.Even by a administration division chief with professional mediation of human relations, It becomes indifferent to the human relations of his own home. It has surfaced in recent years as various problems for which the society side which was nestling up that he should be adapted also began the breakdown.However, a world is not still made into how to look at it.And the will wished that he does not want to be concerned is making the thinking stop live long. “Place of family togetherness” is “Place that doesn’t change”, and to actually feel the happiness that it invents, all families should experience “Consciousness change”. In the last scene, although the son flipped Debussy skillfully, there was a figure of the family who leaves without applauding. Family everybody’s escape play (road movie) drawn immediately before was performed synchronically. It was filled by the impulse which destroys a thinking stop. As a result, the last scene induced impression. The size of what is destroyed increased by minimum performance. Like Robert Bresson, the size of things increased seriousness by expressionless players. The serious feeling also became deep as humorous production. On the other hand, the road movie was lively motion-like. The bunch of the feeling killed till then was exploded to movement. The contrast was skillful. This is a TV screen. Weekday does not look at TV almost. Holiday is seen bringing the recorded program together. The movie borrows and sees DVD. As for several years ago, every week went to Movie theater, but almost it does not go recently. The projector became cheap, installed the simple screen to the home. There are a lot of movie theaters in Tokyo, and an old work is screened. There are a lot of film festivals, too. The valuable movie is to like to go to seeing, but because of the habit of seeing at the home, it goes to the big rental store and borrows. Stopping looking at a “popular work of hurry” and “valuable work not made DVD” as a result, a movie freak is retirement…Am I going to Hikikomori? Setagaya, Tokyo, Japan. 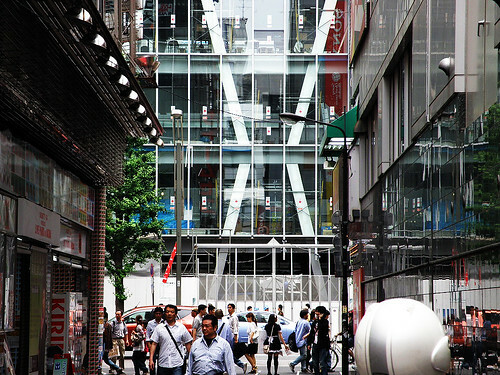 It is located at the merging of two highways, Route 246 and Setagaya-dori, just outside the central area of Shibuya. This town, composure than central area, many bar and shop. I have to enjoy sometimes. 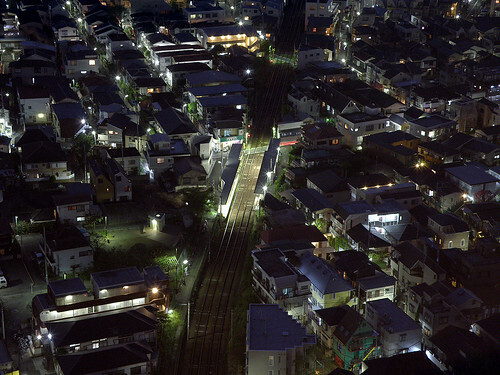 This shot is taken to a residential area and Tōkyū Setagaya Line. Followed by low-rise housing along the line. The Tōkyū Setagaya Line is a light rail line that is operated by Tokyu Corporation. It runs from Sangen-Jaya to Shimo-Takaido, entirely within Setagaya, Tokyo. City outside of the Yamanote line, except along the major road is a residential lot. And go to the back-street, there are many small bars. Aka Chochin, gives color on the street. There is also a modern bar. Smoke and the smell of grilled chicken, invite the appetite. In an old house that collapsed on the point, they do exist. Front, many modern buildings, some highway. This is not a slum, is known as an old alley. This is one of the charm of Tokyo. Newly developed areas is more uniform city. The city is required to be varied. Sunlight has a strong. 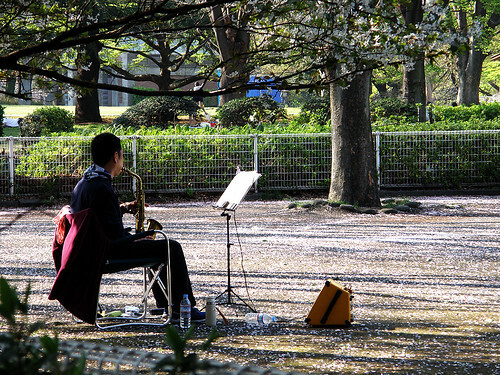 suddenly, Tokyo is warm from last week, has been the sweet spring breeze. While walking, have to know more darker the shadows. “Shadow” has a impression of substance. There are “ephemeral” but “weighty”. The shadow of this season is very wonder, is fascinating. I want to take a lot of shadows. 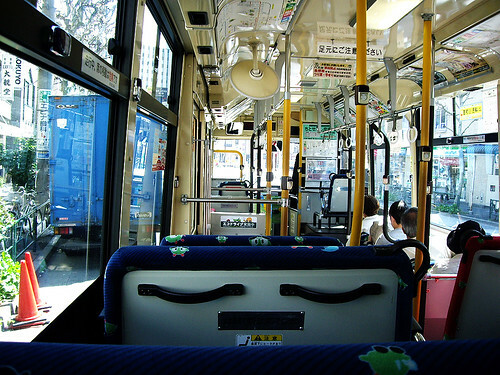 The Toei Bus is a bus service operated by the Bus Service Division, the Tokyo Metropolitan Bureau of Transportation. It is also called To Bus. I love the To Bus. Tokyo “subway system” is very convenient for the city, like a black hole, you lose the town on the way there. Even if I lived in Tokyo for a long time, never got off the subway station a lot. And the bus ride, it was resolved, I love to leave the streets. City have seen many changes in the weather”, I like that in Tokyo. 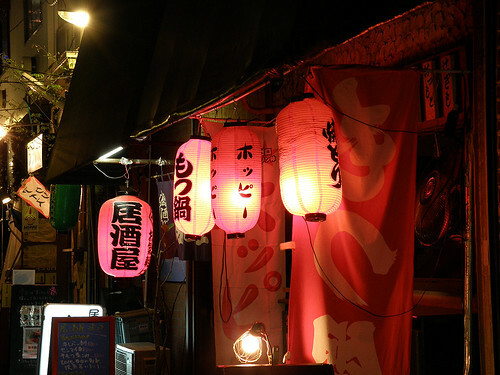 Sunday to the theater to “Shinjuku Golden Gai” I went to. Act by Bull Docking Headlock. 40 was not just a small theater. Here is “The Hanazono Shrine” adjoining, was built after the Second World War “row houses built in wood shop,” in line like a matchbox across a narrow lane. Also known as street artists gather many journalists. 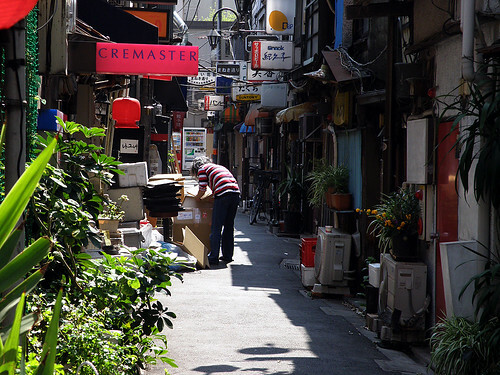 Tokyo is such a “bar street” and some still remain. To a nearby park, went for walks. 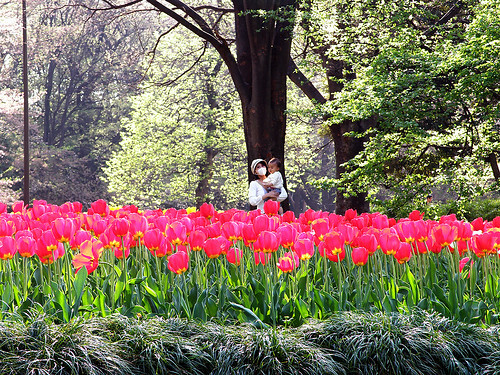 This year’s cherry blossom viewing season has lots of low temperatures, the weather is too bad. But on this day, very warm, was crowded with many people. Cherry trees are very scattered in large measure, the wind was blowing a good spring. The dance of the pollen season, many clad masked. Today I went for a walk to the neighborhood.